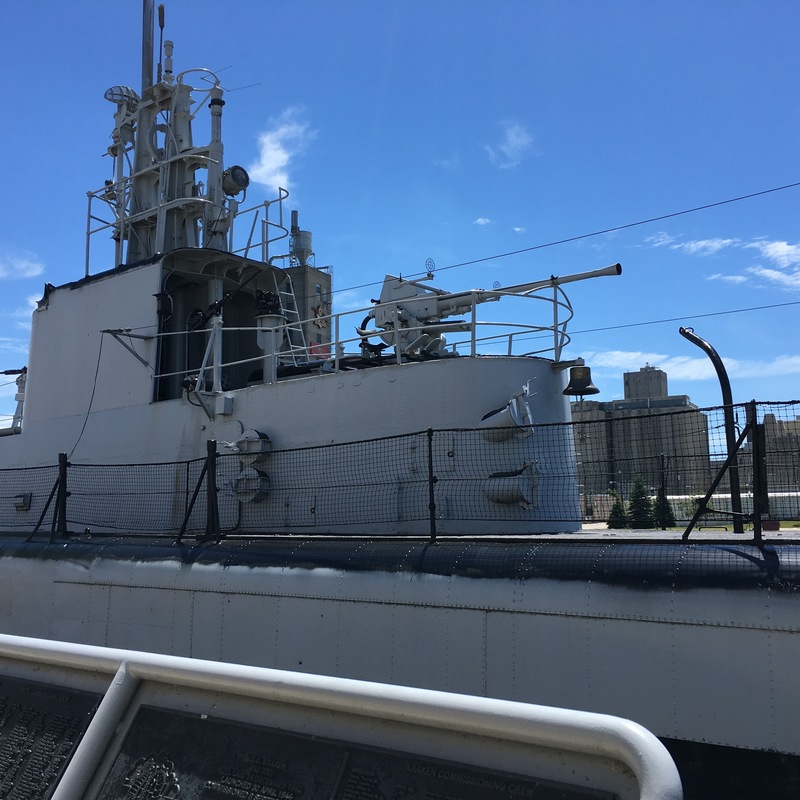 The USS Cobia is a WW2 Gato Class submarine on permanent display in Manitowoc, Wisconsin at the Wisconsin Maritime Museum. 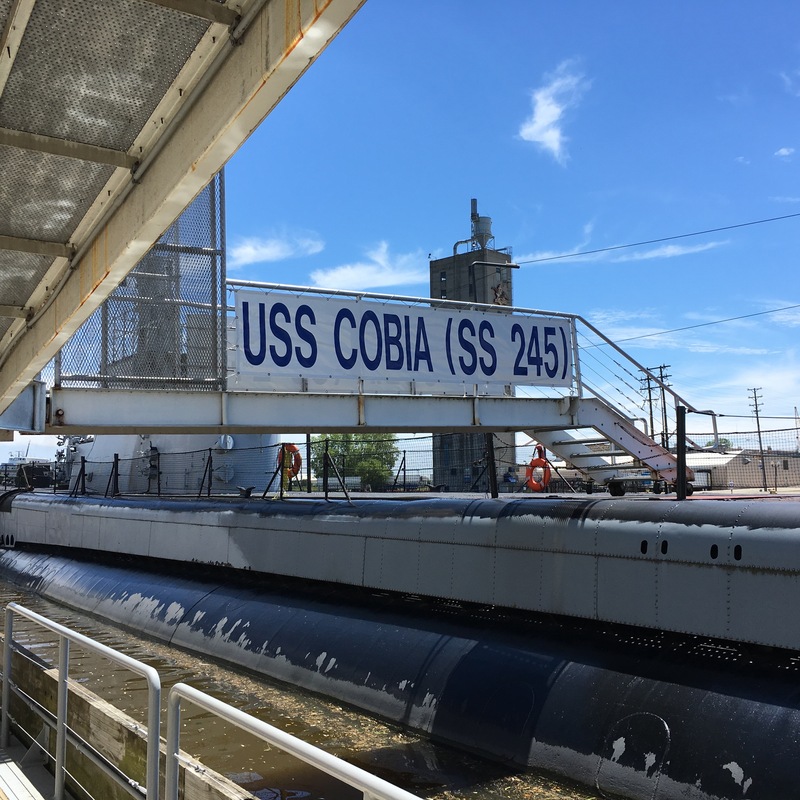 The Cobia was actually built in Connecticut but is exactly the same as the 28 submarines built in Manitowoc during WW2. The building of 28 submarines in a fresh water, inland port is something of a story in and of itself. 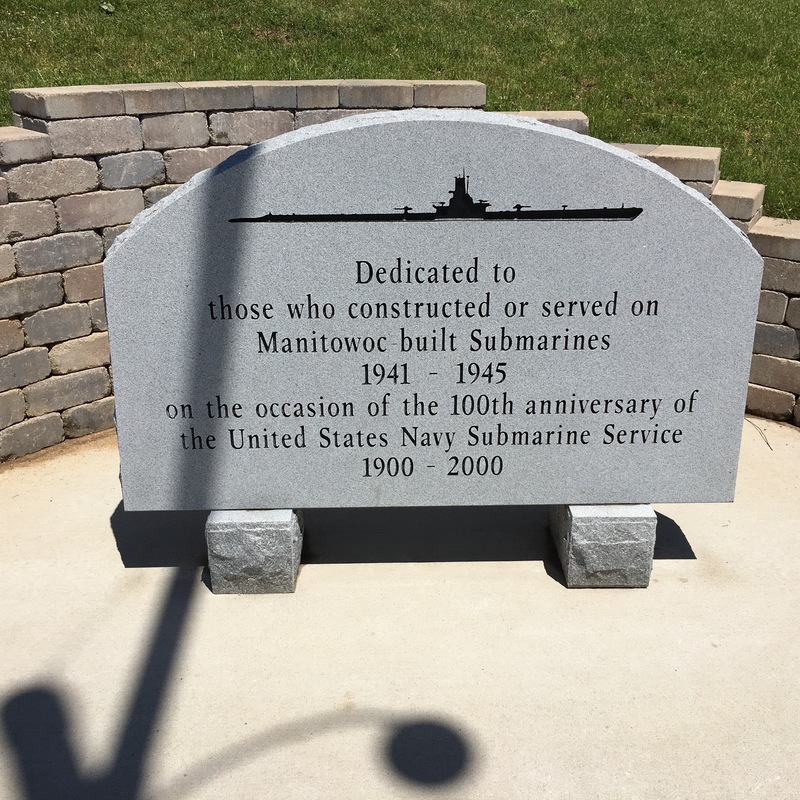 The US Navy needed more submarines after we entered the war and the Manitowoc Shipbuilding Company was one of the few shipyards that had the capacity to build subs. The Navy had a few obstacles to overcome if it hoped to get the subs into the Pacific Ocean in the fight against the Japanese. First, they adapted a side launch technique that enabled a completed submarine to be launched in a relatively shallow river. They accomplished the feat 28 times. From there they had to figure out how to get the boats (subs are called boats in Navy parlance) to the ocean. From the river the completed submarines would undergo sea trials in Lake Michigan (in all kinds of weather including the bitter cold of a Wisconsin winter). After the sea trials the sub would travel to Chicago and link up with the Illinois River. 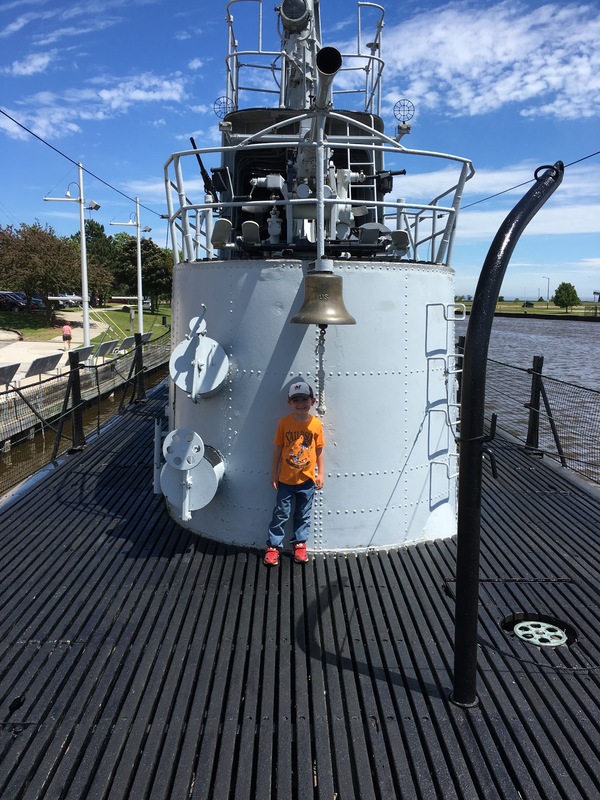 A special type barge was constructed to transport the sub from the Illinois River to the Mississippi River where it would be transported to New Orleans and the Gulf of Mexico. From there the sub would travel to the Panama Canal and from there to the Pacific Ocean and eventually Hawaii where the US Submarine Command was located. From Hawaii and Australia the new subs would do what are called “patrols” or missions. The usual task was to sink Japanese shipping and if possible warships of various sizes. Other tasks included rescuing Allied pilots who had to ditch in the ocean, reconnaissance missions and supply runs. The 25 Manitowoc boats that saw action had an impressive record sinking 128 Japanese ships. Four Manitowoc boats were lost most with all hands. The memorial to the lost boats states they are on Eternal Patrol. The tour of the Cobia takes about an hour with plenty of opportunities for questions for the tour guide. The guide describes every facet of a WW2 submarine from how it dives, how it fights, how it evades depth charges, how the batteries are recharged and how the crew lived on 2-3 month patrols. I can sum up how the crew lived on a submarine with one word-misrable! Also imagine a cramped sleeping arrangement on a “rack” (bed) that you shared with at least one another man. Twenty-four men were on duty at all times while the other 48 slept or relaxed. For this reason they slept in shifts with one man getting into your bed as you got out for duty. For this reason beds were often called “hot beds” reflecting the fact it was just slept in. No wonder the men of the Submarine Service received extra pay and the best food in the Navy. They also had extensive psychological testing before being accepted as a submariner. Submarine Service was not (and is not) for just anyone who thinks submarines are cool. One of the more interesting facts the guide related is that the US genuinely considered creature comforts on our subs. This meant that although miserable by any reasonable standard our submariners had it much better than a crew on an Allied sub or enemy sub! My first thought on hearing this it must have been absolute hell on a Russian submarine since the Russians were not known for providing any kind of creature comforts to their Army or Navy personnel! The occasion for our visit was the back end of a fishing trip that my son, six-year-old grandson and I took a week ago. My son and I had been on the tour before and we thought it was never too early to start teaching his son something about WW2. 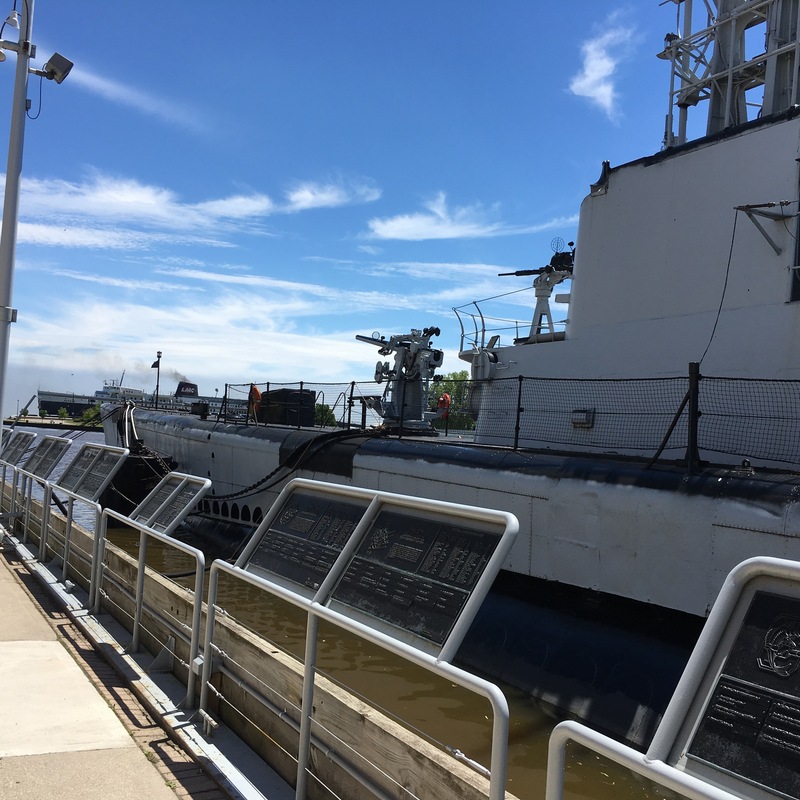 The museum is kid friendly and features much to look at including a room full of ship models, an interactive area about Great Lakes Waterways and submarine exhibits that are not on the sub itself. Admission is reasonable at $15.00 per adult with discounts given for senior citizens and military veterans. Children between the ages of 4-12 are $8.00 and three and under are free. 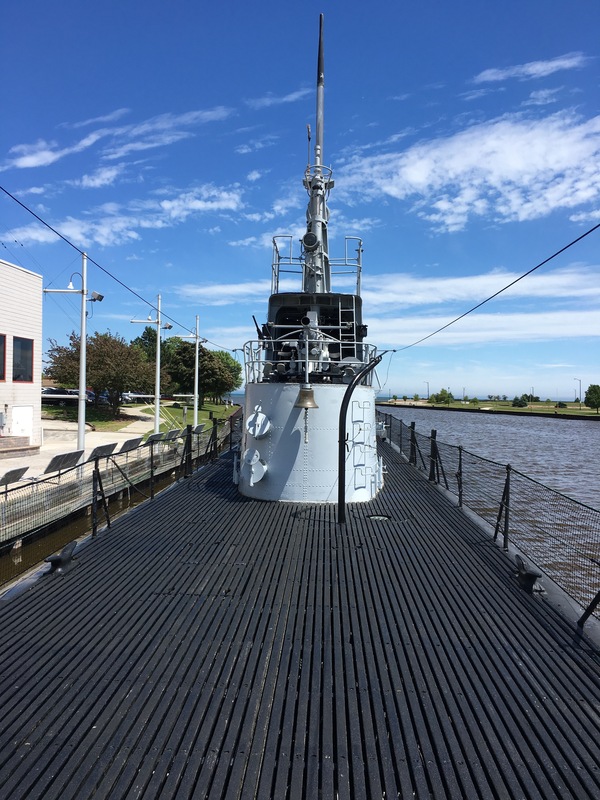 The Wisconsin Maritime Museum is an important part of Wisconsin’s history during WW2 and not widely known. It’s a great day trip to a lovely city on the shores of Lake Michigan. Highly recommended! The tour gives credit to the builders of the sub as well as to the crews that manned them. The Cobia is 80% functional. Overnight educational stays are possible. What a cool thing to do with the kiddos. 40mm anti-aircraft mount. The sub would only fight airplanes if it absolutely had to and preferred to dive when a plane was sighted whether friendly or otherwise. This was done to preserve secrecy. Staircases are provided to enter and exit the sub. I had little trouble even though I use a cane. Obviously though the tour is not wheel chair accessible. 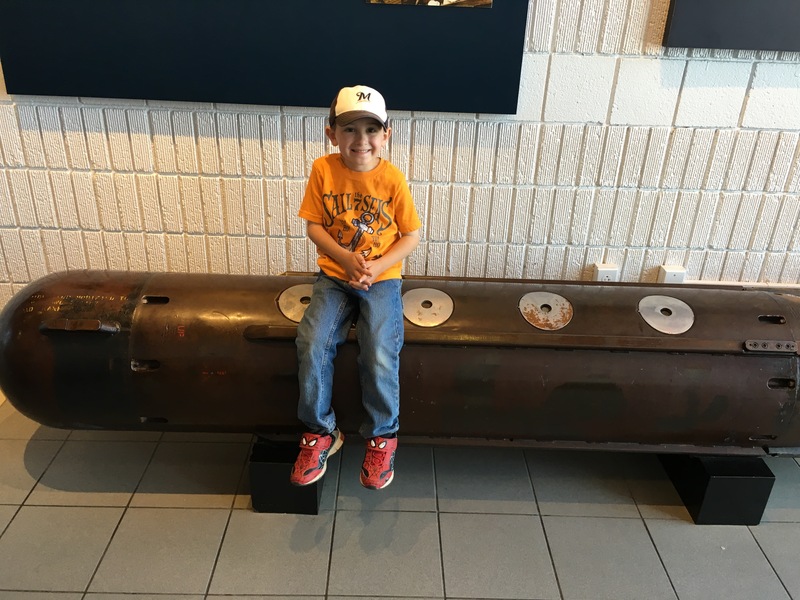 My grandson on a torpedo. If I remember right the sub had 14 torpedoes, 8 forward and 6 aft. This gives you the idea of the narrowness of a WW2 sub. My grandson actually asked the tour guide a pretty good question for a six-year-old.